Today, July, 5, is the last day to register for the Screwpile Lighthouse Challenge without paying a late fee. Register here. When you can fry an egg on deck and your dog won’t even go outside, you know it’s time for Southern Maryland’s saltiest summer regatta: the Screwpile Lighthouse Challenge (SPLC) aka the Screwpile, held this year July 14-16 outside the mouth of the Patuxent River in Solomons. As per usual, race headquarters will be at the Holiday Inn Select. If you’re new to this scene, first thing you should know is this: it’s a lighthouse, not a bad word. Screwpile-style lighthouses, cottages on stilts that screwed into the mud, once marked shoals up and down the Bay but then didn’t work well for various reasons (ice floes). One is left (Thomas Point). You may tour others on land at museums (Chesapeake Bay Maritime Museum, Calvert Marine Museum). So the memorable regatta name has roots in Chesapeake history, and those who’ve competed in it over its 24-year history have been known jokingly as Screwpilers. More than 75 volunteers from host club Southern Maryland Sailing Association (SMSA), the local community, and yacht clubs up and down the Bay contribute to making this annual event a success. 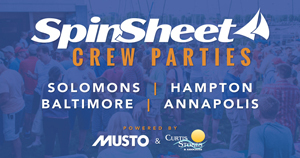 SpinSheet has been an active sponsor for 21 years and will be on the water taking photos, tossing tee shirts to the party crowd for Friday night—SpinSheet night—running our popular tattoo booth, and taking lively party photos that surely you will frame and keep forever. Newcomers to this regatta should know this: it’s relaxing and fun, so sailors come back. The race committee is filled with top-notch talent, so top competitors come back. Teams come in from as far north as Baltimore and as far south as Virginia Beach. At print time, only a third of the expected boats had registered—and this is not unusual as people get wrapped up in the Fourth of July. Take note: after July 5, racers pay a $50 late fee. If you’re reading this—and yes, I mean you who have not yet registered—time to get on it. Dress code? The parties are very fancy. Just kidding. Wear something cool, as it’s always hot. Bad Hawaiian shirts tend to find their way to the Screwpile, so be yourself. Don’t be shy. Don’t bother shaving; no one else will. Make sure to bring some cash for food, as Mount Gay Rum sponsors this thing, and the rum flows. They sell some nice shirts at the party, too, so come wallet-ready. Where are you, one-design racers? Screwpile Regatta organizers await your entries… For now, this is shaping up to be a PHRF racing event. As in the past few years, Friday and Sunday will be set up for buoy racing; Saturday will be for the distance race. Cruising class participants will only race Saturday and Sunday on their own course (but they’re welcome to come to SpinSheet night Friday at the party tent). Top finishers from the 2016 edition who were registered at print time were Jay Thompson’s Restless, David and Jacki Meiser’s Easy Button, Julie Ann and Paul Wash’s Cheeky Monkey, Larry Ray’s JRay, Erik Wullf’s Endorphin, and Dave Prucnal’s Ultra Violet. See you in Solomons July 14-16. For the daily currents and photos, click here. For more about the regatta, click here. To register and see all regatta documents, click here. Find more SpinSheet coverage here.